What do you like about teaching counseling observation? There are several aspects to it. First, I enjoy the training piece itself and being able to interact with students about live counseling sessions. Students view actual counseling, not a role play, and this is invaluable in the learning process. This is often the first time that students can see what they’ve been learning in class come to fruition in a counseling room conversation. That is exciting. It’s a dynamic learning environment. A second aspect I like about teaching this class is that I always learn something. By its very nature counseling is usually a private enterprise; you’re meeting one on one behind closed doors. You can perhaps talk to a supervisor or colleague about “stuck places,” but your counseling is a private endeavor for the most part. In counseling observation there’s an incredible opportunity to have many people put eyes on your counseling, so I always learn. Students are asking great questions—ones that I may not have thought of—and it provokes me in the best possible way. A final aspect that I love is seeing the way students develop an affection for and commitment to the counselee over the course of the semester. That means that there are more people praying for this counseling relationship and this particular person than in any other counseling I do. There’s this focused attention, so it’s always exciting to see what God does over the course of those twelve weeks. What often surprises you when you teach observation classes? I’m always surprised and encouraged by the great interactions and questions that students have. The feedback they share often challenges me to think differently. These students are involved in my counseling process; I’m just a few weeks ahead of them in the sessions. The comments made in the classroom can be and often are incorporated in how I interact with the counselee in later sessions. I’ve also seen students sometimes surprised because they find themselves struggling to translate what they’ve been learning in the classroom into an actual counseling encounter. It’s common for students to have the expectation that things should be moving faster than they are or that there should be more “fireworks” than there are. But change generally takes place over time. I know it does for me, and God is patient in the process! What I hope students are seeing is a constructive conversation that the Spirit is using to move the counselee closer to Christ. What happens in a formal counseling session is fundamentally no different than when you are intentionally getting to know a person. You’re building a relationship with that person. That takes time, trust, and honest conversation. 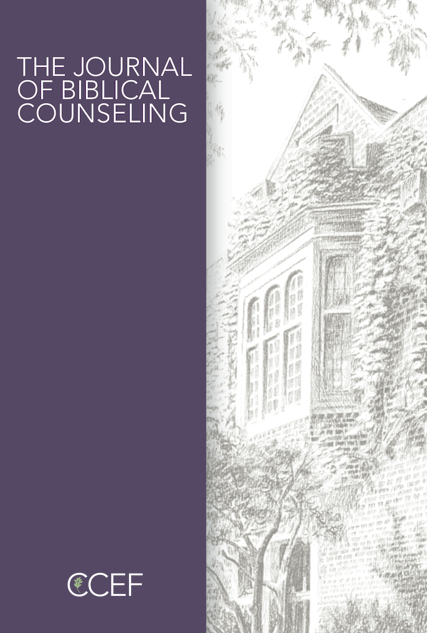 The counseling observation gives students the opportunity to see a counseling relationship play out over time. And how it plays out is always surprising to them. Is there anything specific about this particular counseling case that students will get to encounter? One of the things that they should expect to see is that the presenting issues are not always the full story of what a counselee is struggling with. They will get to see how the counseling process develops and changes over time as I get to know the person better. The priorities shift over time. This particular counseling observation shows that. Another thing they can expect to see is the importance of having others friends or church leaders involved in the counseling process. What is most helpful for students when it comes to taking counseling observation? Students actually get to see live what they’ve been learning in the classroom. They have to translate theory into practice. It also gives them the closest opportunity (other than doing the counseling themselves) to consider, “What would I do in this moment?” I encourage students not to passively sit back and watch the sessions unfold. Instead, I encourage them to imagine what it would be like to sit in my seat, to hear what I’m hearing, and to then decide for themselves, “What would I do here? Where would I go now? How would I respond? How am I feeling about what the counselee has said?” Students are invited to be participants not just observers. How does this particular class help us become better counselors/friends/pastors/etc.? All of our counseling courses impact our own hearts. Any material we are learning that is useful in the lives of other people is first and foremost impacting our own life. There’s a way in which the counseling observation class is very heart-revealing for students. Students have to grapple with their own fears and, not infrequently, their own impatience. They have to wrestle with things like, “Do I like this counselee? Why or why not? How would I respond to this? How is what is being said impacting me personally? How is that going to impact the way that I would help him or her? What am I wrestling with in my own heart?” Because it’s a developing relationship on display, there’s a way in which it deeply engages the hearts of students. One of the things the students get to see is the interplay of biblical content and process—what’s actually happening live, relationally in the room. They get to see how to bring biblical themes and perspective to particular struggles. They get to experience what it looks like. How is Scripture used in a counseling session? When is Scripture used in a counseling session? They also get to observe the importance of what’s happening relationally between the counselor and the counselee. What is the counselor attending to? What kinds of things does he make comments about? The counseling observation gives a unique opportunity to see biblical content and perspective in action, to examine your own heart in the process, and to observe what is going on in the room relationally. Why should students take this particular class? I think this is a critical class for better equipping people to walk alongside those who are struggling. We strive in our courses to be practical and not just stay on a theoretical level. We’re always asking questions about how the material impacts our own lives, how it looks in our relationships, and how it looks in the context and culture of the local church. But in this class in particular, you actually see it happening. There’s no substitute for that. My hope would be that over time we would have multiple counseling observations available for students. This is a class that I would say the more times you can take it the better. The more you get to see people counsel live and see hear their thought processes, the more you are helped as a developing counselor. So hopefully this is a preview of more to come in our course offerings. Please note: Dynamics of Biblical Change and Helping Relationships are prerequisites for this course.